One-pound batts are standard unless you specify otherwise, but batts can be made any weight – 8oz, 12oz, 16 oz, etc. The carded batts are about 22“ wide by 46“ long, depending on the nature of the fiber. Needle felting enlarges these to around 30” by 54”. 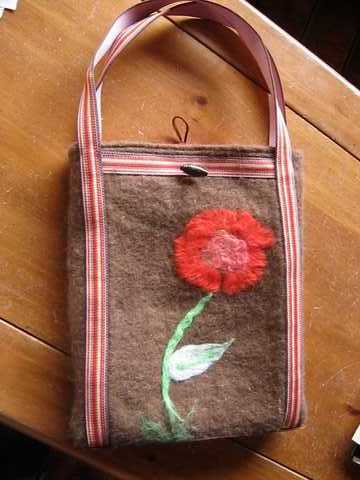 Uses for felted batts are infinite – Art work, crafts, clothing, slippers, quilt batting, rugs. If you have a project in mind, give us a call to discuss the best weight and density of felt for your project. Click here to view some examples of needle felted projects. The charge for making soft needle felt or “pre-felt” is $5.50 per batt, in addition to the initial carding costs. This fee covers up to three passes through the needle felting machine. The first pass yields a soft, fairly loose felt, suitable for quilt batting or as a pre-felt for wet felted projects. Each additional pass tightens the felt. Because the fibers in a single batt all run the same way, a prefelt batt is strong only in one direction, and lacks the integrity for making garments or other utilitarian items. Our “garment felt” is made by combining two batts with the fibers running perpendicular to each other and run an additional three to five times through the needlefelter to create a strong, denser felt that can be cut and sewn into various projects. We make garment felt in light, medium, and heavy weights. Heavy garment felt is usually made with two 1-lb batts, medium garment felt uses two 12 or 13-oz batts, and light garment felt is made with two 8 or 10-oz batts. 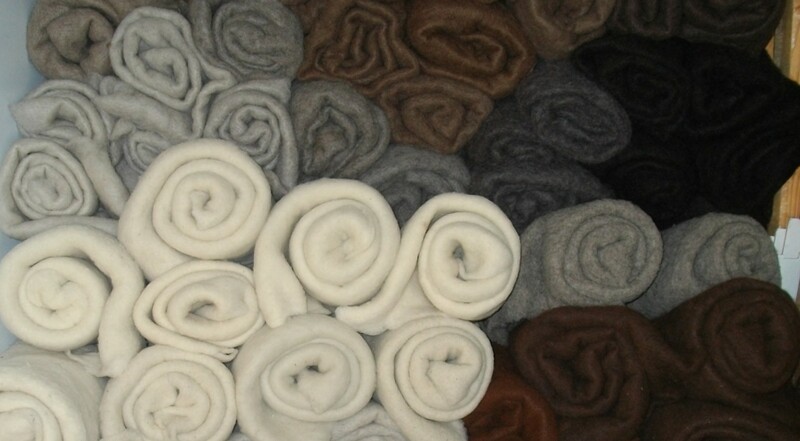 When 100% alpaca is used, the felt usually needs to start with at least 12-oz batts. The fee for making garment felt is $14.00, or $7.50 for each of the prefelt batts used to make the garment felt if a larger piece is desired. Batts can be combined to form a sheet up to 60” wide and infinitely long. Custom felting service is available for an additional $20.00/hour charge. Please print out our Fiber Processing Form and include a completed copy with the fiber you send us.